Given that this weekend is the weekend Dan moved into our apartment last year, with me moving in a few weeks later after the wedding, I thought I’d take a look back at the apartment since then and how it’s changed. I’ll start with the room that has come the farthest – the dining room. You already heard about the baby jail bedroom we’d be using as an office. Those yellow stripes still give me nightmares. 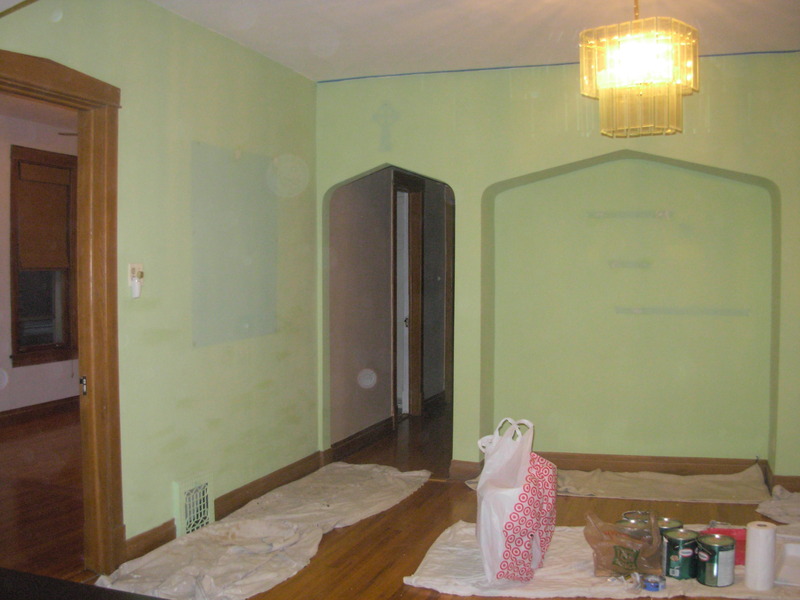 Well, the faded sea foam green dining room walls weren’t much better. Look how much the color faded. That must have been some high quality paint. Oh, and did you notice that light fixture? Circa 1970? 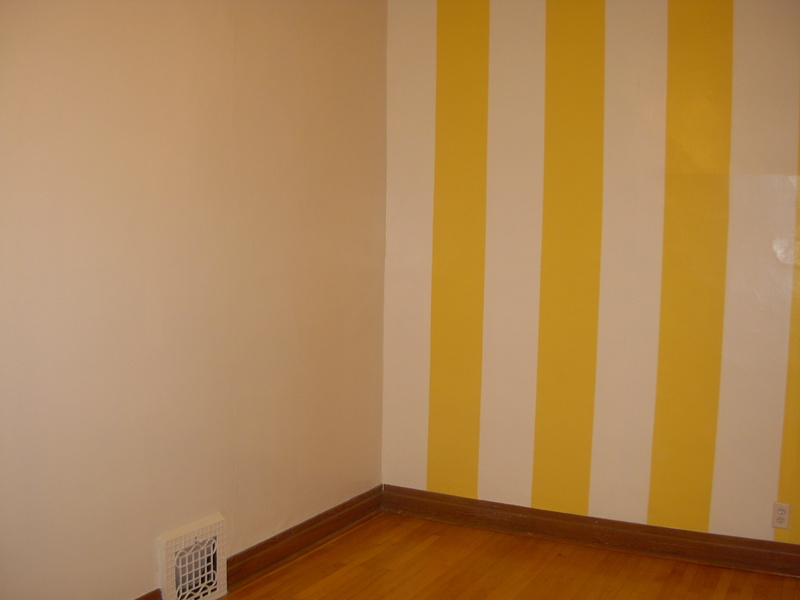 We started the room transformation by deciding on a tone for the room. I wanted something more on the formal side, since I love throwing a good dinner party, but definitely wanted to keep it from feeling like you couldn’t touch anything in there. I also knew the room had to have functionality. For one, it needed to have a dining room table that could expand, but the table had to be small on a day to day basis. Also, I knew this room needed to offer some storage options, but I didn’t want it to look messy. Back when I was doing this room, I had no idea what a mood board was, so none exist for the dining room. All I had was a feeling. I wanted the room to feel warm and inviting. The color choice? Bold red. For some, this can emit a firy, uneasy feeling, but the color is soothing to me. After about a year, I did think the room needed some softening up. As you saw in a previous post, I added some delicate curtains and that really did the job. On to the furniture. As you know, I turn to craigslist whenever I can. And why wouldn’t I? The furniture pieces aee usually well priced and still in excellent condition. The first piece we purchased for the dining room was the table. 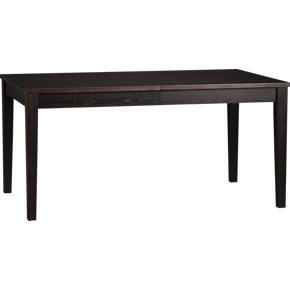 It’s the Madison Extension Dining Table from Crate & Barrel. It’s well made and extends to seat 8 people. We bought 4 of the Madison chairs with the table and then lucked out majorly when we were able to purchase 2 more from another seller on craigslist. With all the glassware we were given at our showers and for our wedding, I knew we’d need a place to store them. Our dining room has a cute little nook on one of the walls, and I was hoping to find a sidebar to put there. 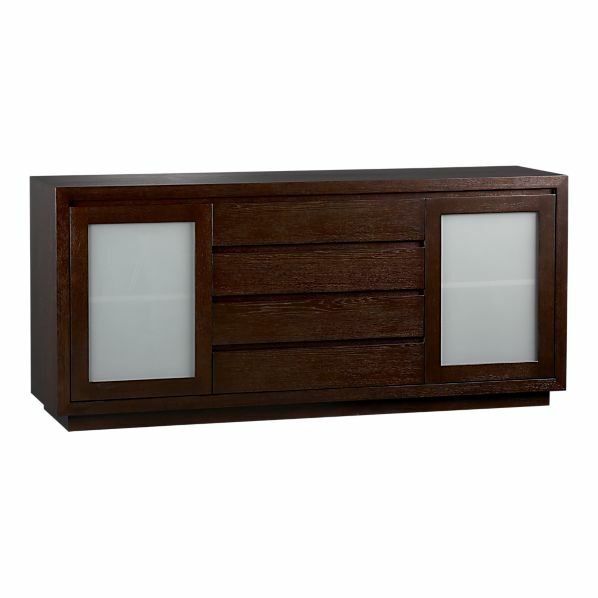 I found the Orion Chocolate Sideboard from Crate & Barrel on craigslist. That was a doozy of a drive out to Naperville, and we had to be super careful with the frosted glass doors, but I just loved it. The wood stain almost exacly matches the table. All our barware is neatly stored away in there, along with my table linens and other odds and ends in the middle drawers. The best part? That baby fit perfectly in the nook, without even a centimeter to spare! The final piece of furniture in the room was a practical choice. Dan and I each amassed a ton of books, and they had nowhere to go. 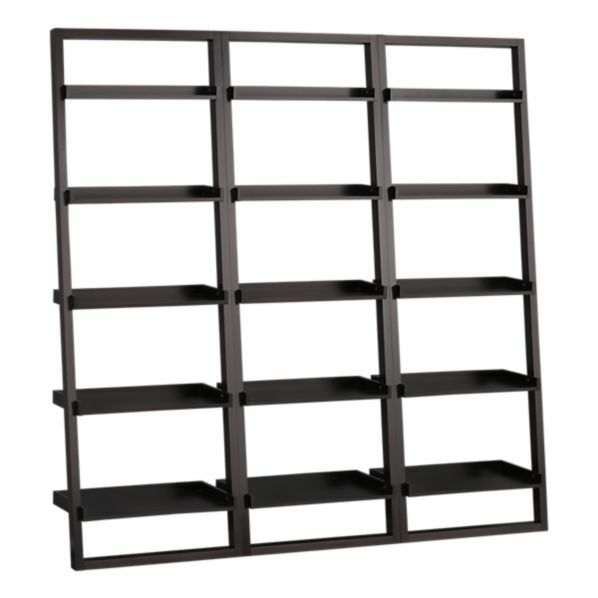 I liked the Sloane Leaning Bookcases from, you guessed it, Crate & Barrel. I searched on craigslist for these for a while, but in the end, I gave in and bought them directly from the store. It was a splurge, but the money blow was softened by gift cards we received for the wedding. Dan took organization a step further than I ever intended by arranging our books by color. No Dewey Decimal System for us. Finally, there were the finishing touches. I added some old frames I already had, and that were conveniently red, to the sideboard. 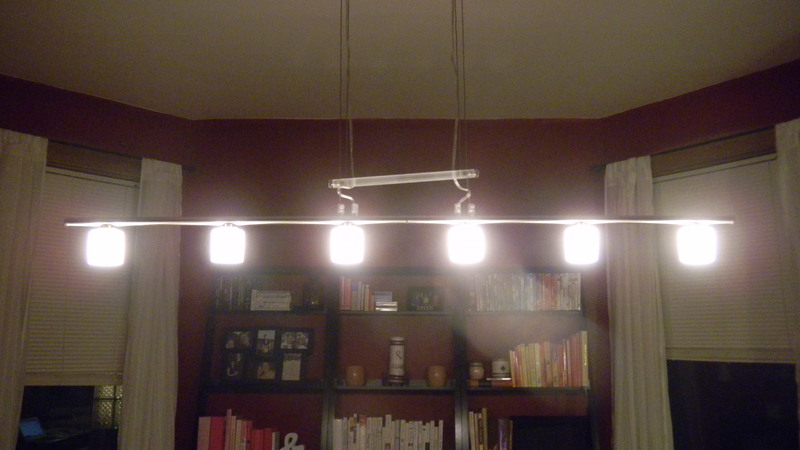 We bought a modern light fixture from Ikea, which my father-in-law was nice enough to install for us. 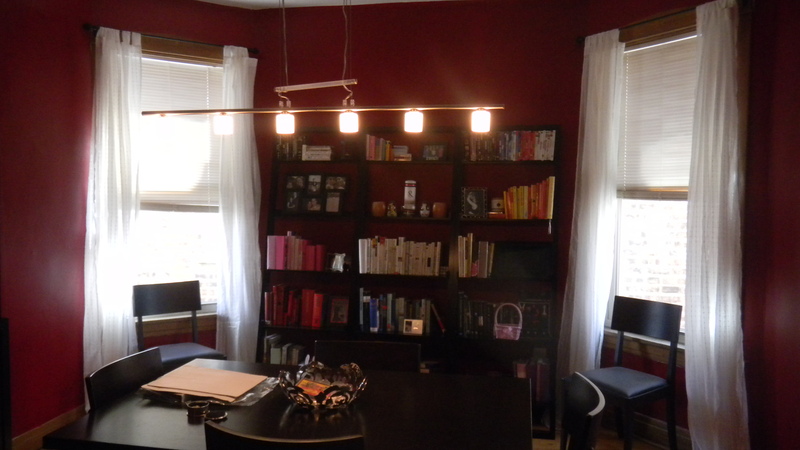 Lucky bonus: the light fixture length is almost exactly the length of the table. 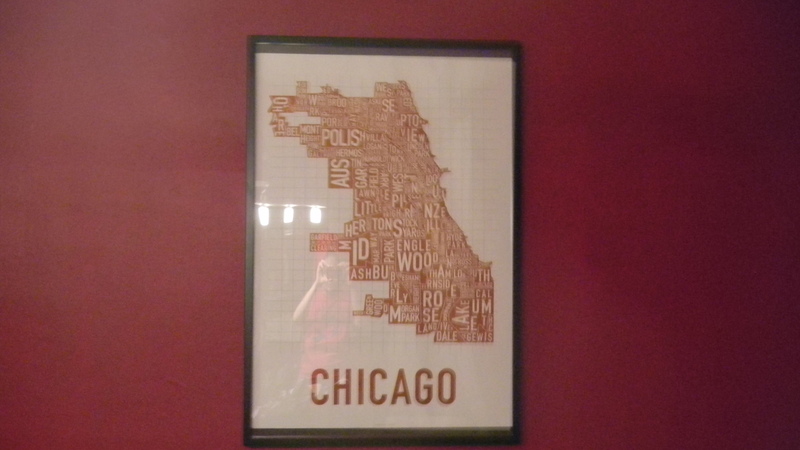 We framed a poster of Chicago that Dan had in his previous apartments and hung it on the wall. 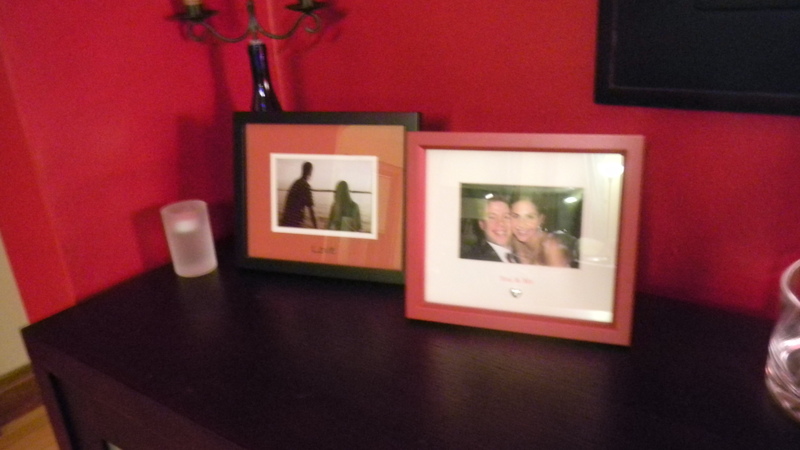 My favorite part of the room has to be the big frame of wedding pictures hanging over the sideboard. My mom bought the frame on clearance years ago and found it while cleaning out the basement. She gave it to us, saying she’d never use it. 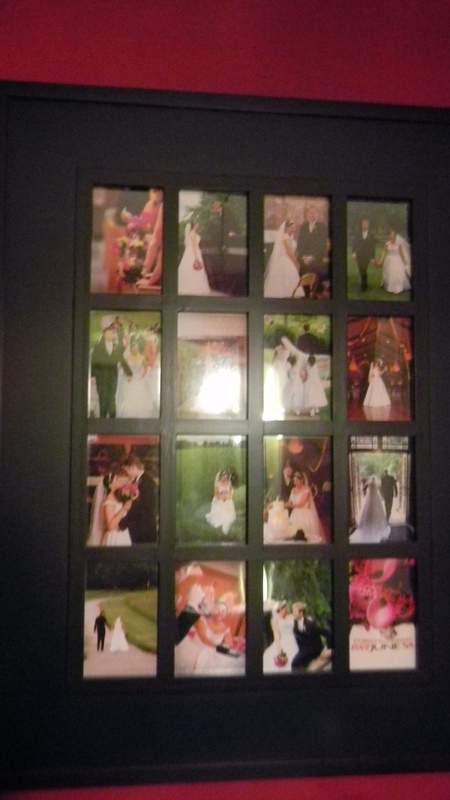 I wanted to hang some of my favorite photos from our wedding somewhere in the apartment, but I didn’t want it to become a display of all the standard wedding poses that every married couple has from their wedding day. 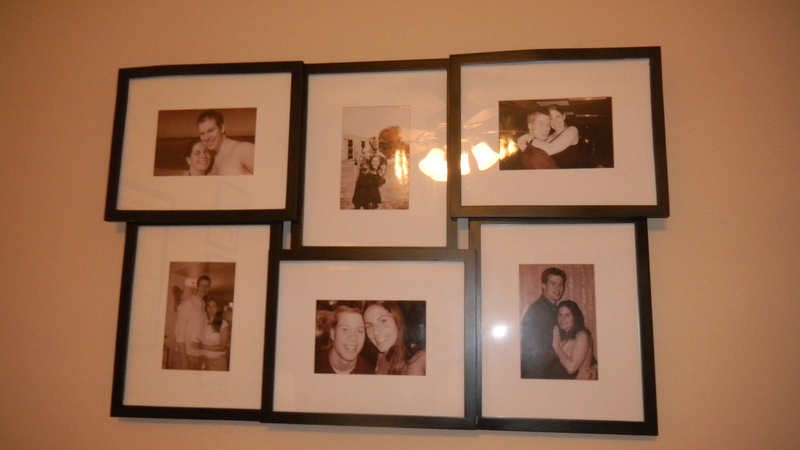 So, Dan and I picked our favorite mostly action shot photos to put in the frame. Plus, I really like that the frame isn’t distinctly noticeable. It’s not the first thing you see when you walk into the apartment, and even not the first thing you notice when you walk into the dining room. It’s subtle, which is exactly what I wanted. Even though I think a room is never complete in the decoration process, as of now, I don’t have any plans to change this room. What do you think? Any ideas for improvement? Baking bread scares me. I’ve tried to bake some on a couple occasions, and the result has never been good…until now. 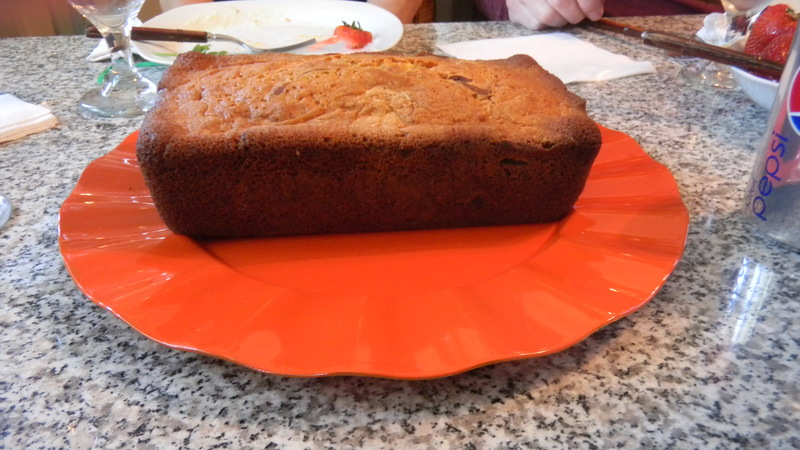 But before this, the healthy banana bread I made came out of the oven with burned crusts, but a gooey inside. 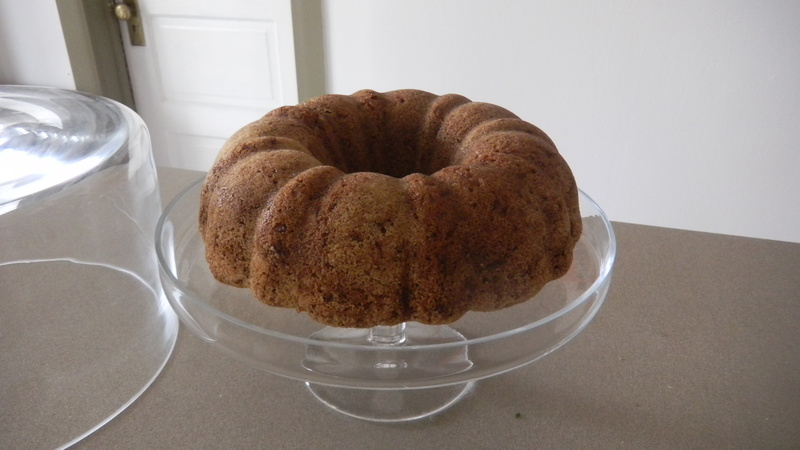 I later learned I should have used a bundt pan instead of a loaf pan. The cinnamon bread I made didn’t rise at all! Seriously, it was a rolled up cinnamon log when it came out of the oven. Never figured out what went wrong there. 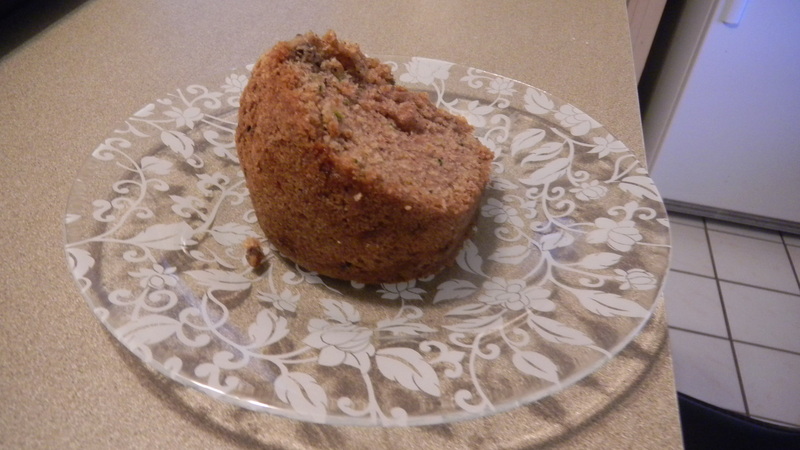 Imagine my delight when I decided to make zucchini bread, and this came out of the oven. Light, fluffy, the perfect consistency. Success! 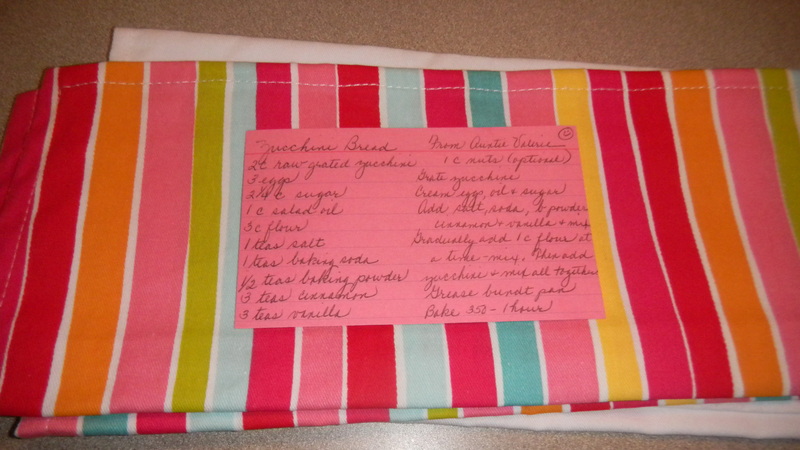 I credit it all to my Auntie Valerie’s recipe, which she gave me as part of my wedding shower gift last year. I’ve been seeing recipe cards in many of the bridal shower invitations I’ve received lately. I think it’s a great way for the bride-to-be to stock up on recipes she knows will work, and to collect the recipes for the traditional family dishes she grew up loving. My maid of honor sent out recipe cards with my shower invitation, and I was so glad she did. 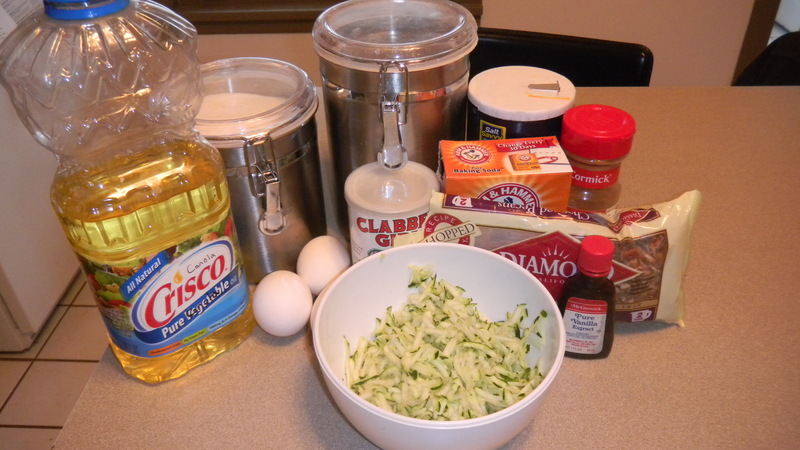 Here’s the one for zucchini bread. 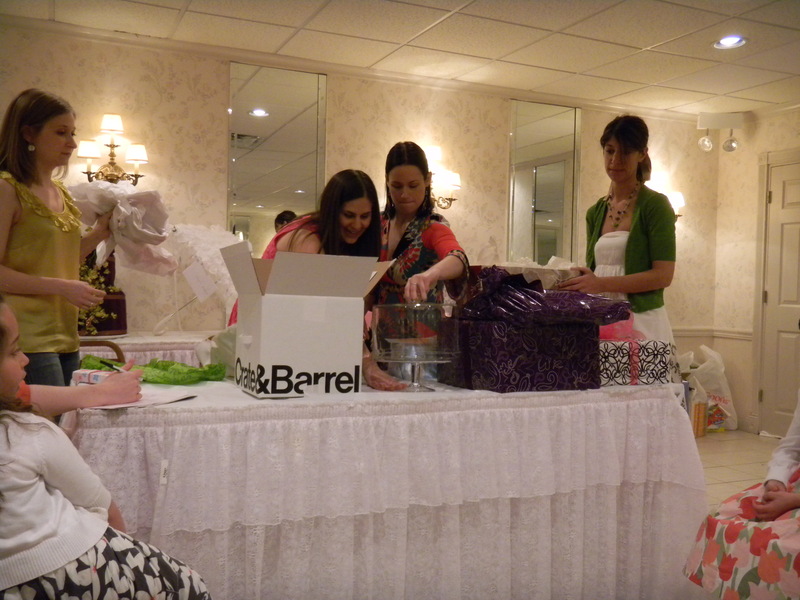 My Auntie Valerie had a whole theme going with her shower gift: cake dome, cake server, and the zucchini bread recipe. Fancy! Here I am opening her gift. Start by preheating the over to 350 degrees. 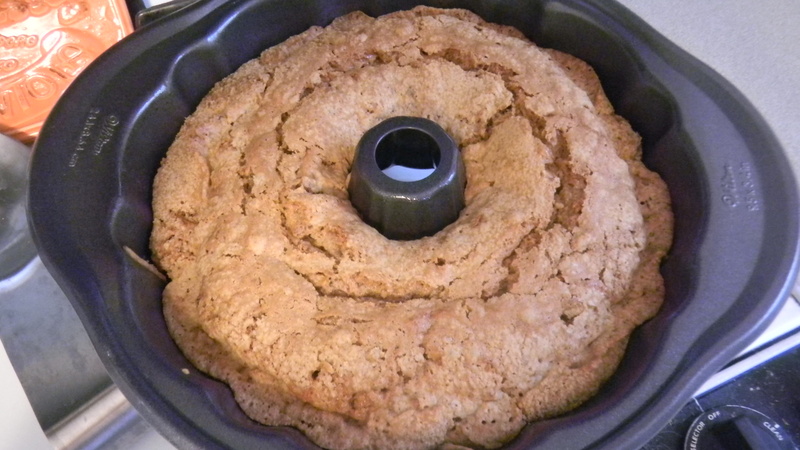 Grease a bundt pan and set aside. Grate the zucchini. Cream together the eggs, sugar, and oil. I used my stand mixer foe this step, which makes it a million times easier than using a hand mixer. Add in the salt, baking soda, baking powder, cinnamon, and vanilla. Mix well. 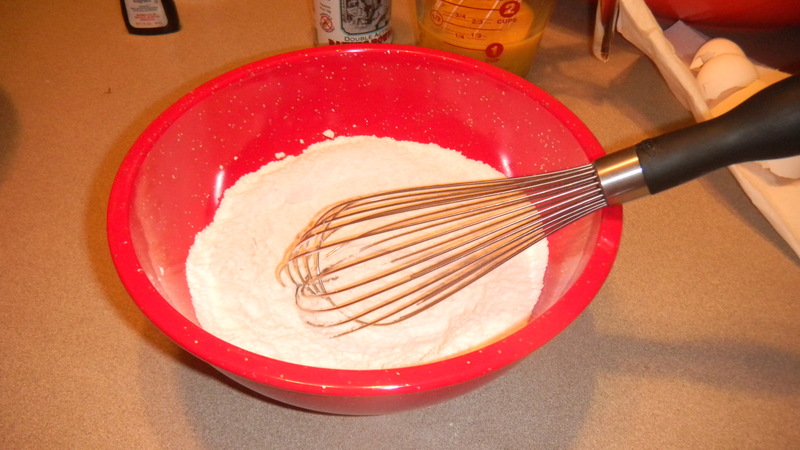 Gradually add in the flour, one cup at a time, and mix. Finally, add the zucchini and the nuts. Mix gently just until all the ingredients are combined. Bake for one hour, until a toothpick comes out clean. Let the bread cool in the pan, then invert the pan onto a plate. The bread should slide right out. Here’s the finished product displayed in my cake dome. Yesterday, I had a great day with my mom. We started off the day at the Network of Strength Walk. Some local women truly outdid themselves this year. While the big walk in Chicago is downtown, these ladies organize a walk every year through a local neighborhood. 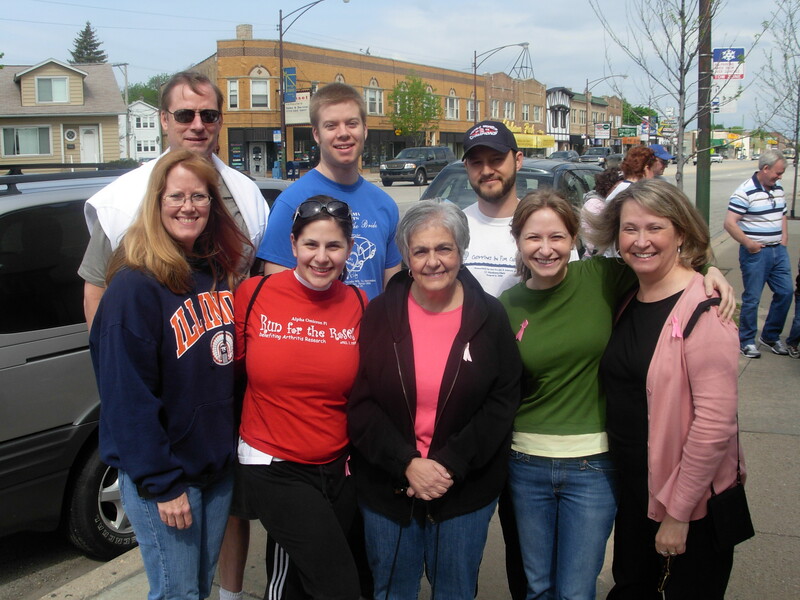 This year, the walk was held in Edison Park and started at St. Juliana’s. The whole 5K was mapped out for us andafterwards, there was a lovely party with music, lunch, desserts, and of course, gallon and gallons of ice cold water. I was lucky to be able to spend Mother’s Day not just with my own mother, but with my new extended family as well. Here’s a group photo of the walkers I was with – my husband, my mother, my in-laws, and Phoebe. 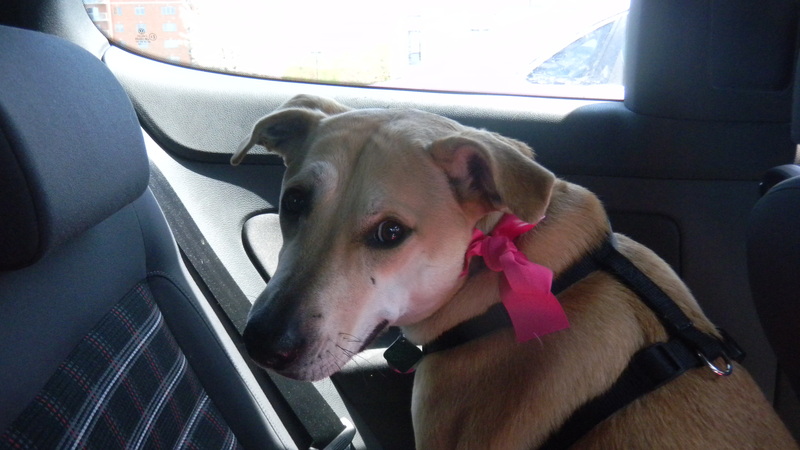 Here’s Phoebe on the way home. She doesn’t look it, but she was pooped. And she’s rocking pink. All totaled, I raised $320 for the cause. Thank you so much to everyone who donated. Afterwards, the whole clan headed back to my parents’ house for a tasty lunch my dad had prepared. You guessed right, I made dessert! 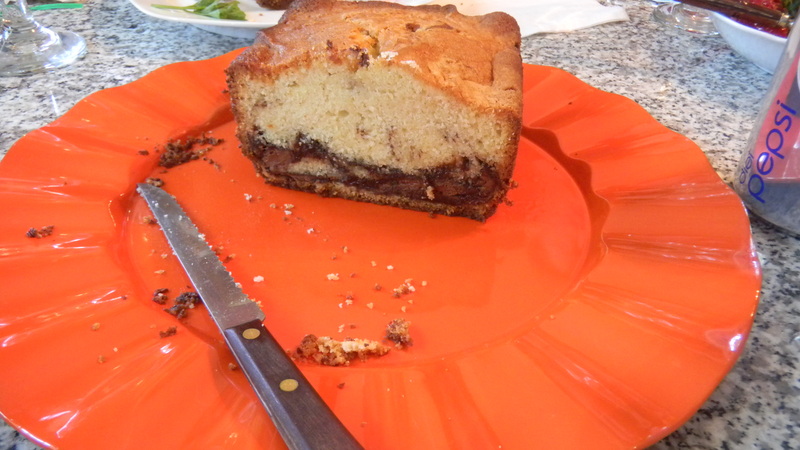 This is a Nutella Swirl Pound Cake. My cousin, Rosemarie, makes this dish for many of our family gatherings and it’s always a hit. My mom really likes it, so I thought I’d take a stab at making it for Mother’s Day. This recipe was originally found by Rosemarie in Food & Wine magazine. 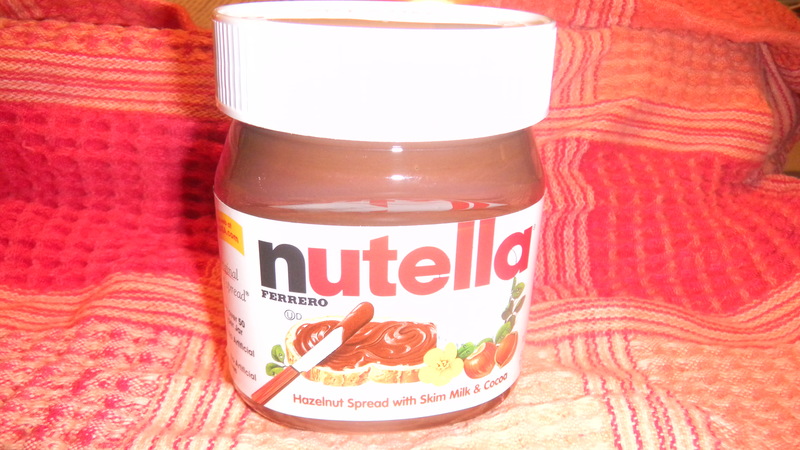 It features a yummy ingredient: Nutella. Set the oven to 325 degrees. Grease a loaf pan and set it aside. 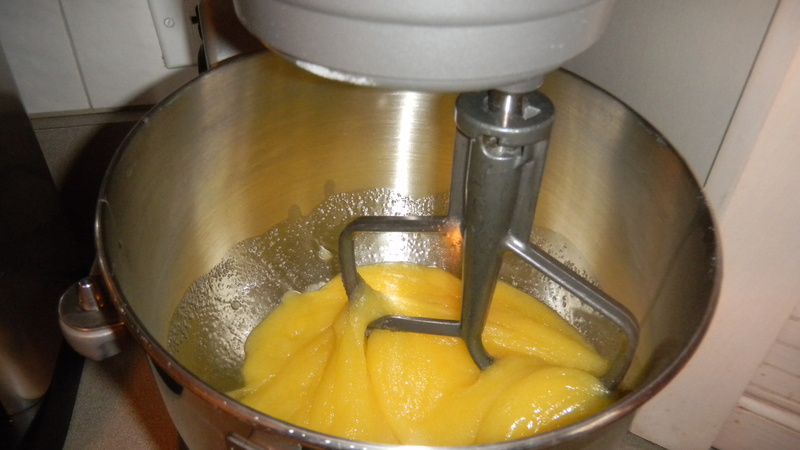 In a large bowl, using a handheld mixer, beat the butter with the sugar at medium-high speed until fluffy, about 3 minutes. 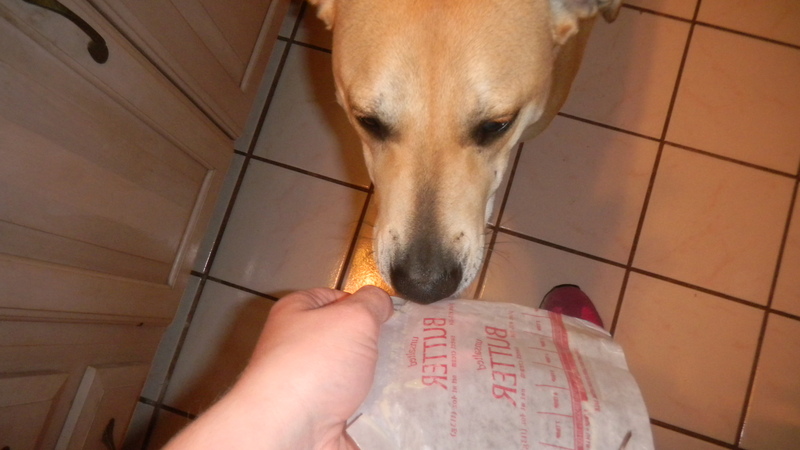 Oh, and if you have a dog like Phoebe, let her lick the butter that got stuck to the wrapper. She’ll love it. 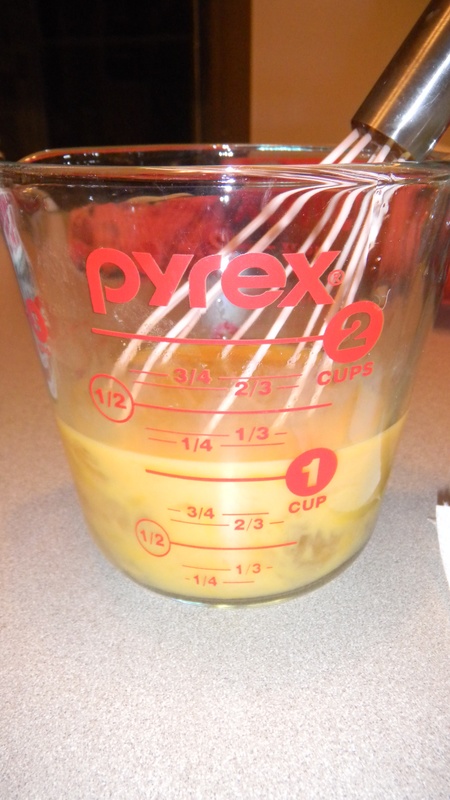 With the mixer at medium-low speed, gradually beat in the egg mixture until fully incorporated. 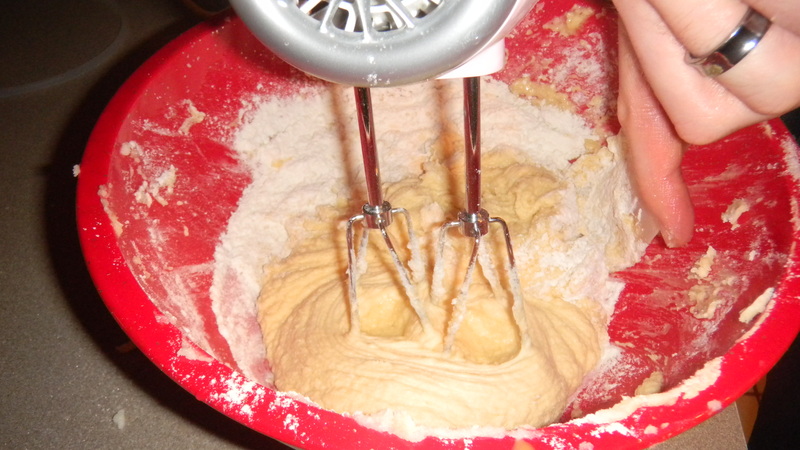 Add the flour mixture in 3 batches, beating at low speed between additions until just incorporated. Continue to beat for 30 seconds longer. 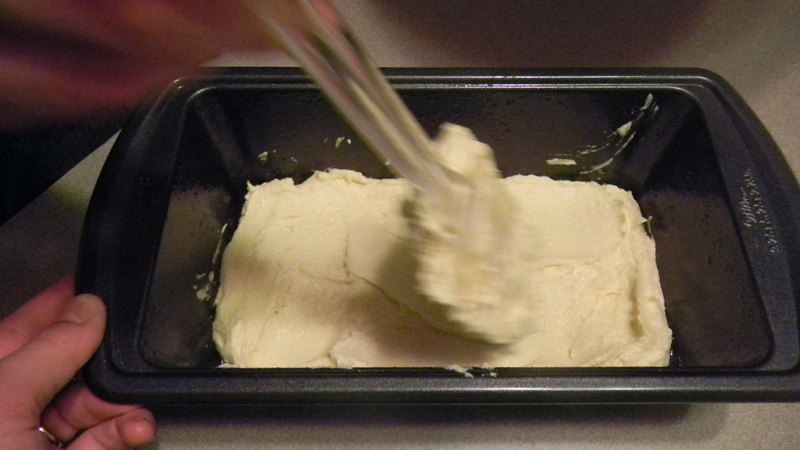 Spread one-third of the batter in the prepared pan. Spread half of the Nutella on top. Repeat with another third of the batter and the remaining Nutella. Top with the remaining batter. 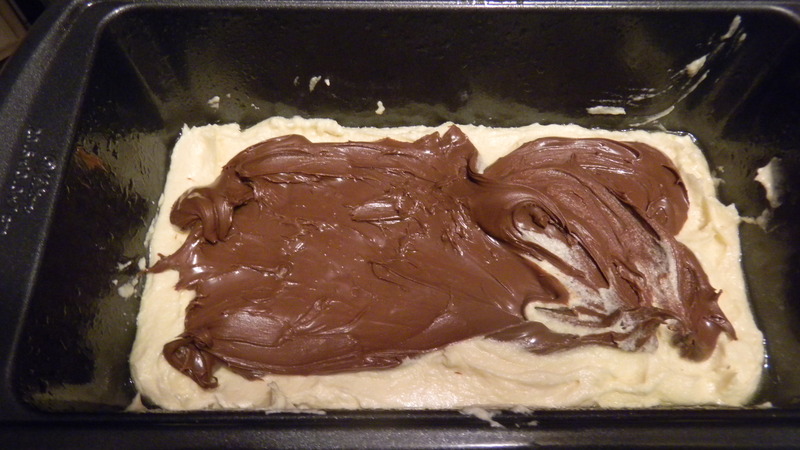 Lightly swirl the Nutella into the batter with a butter knife. 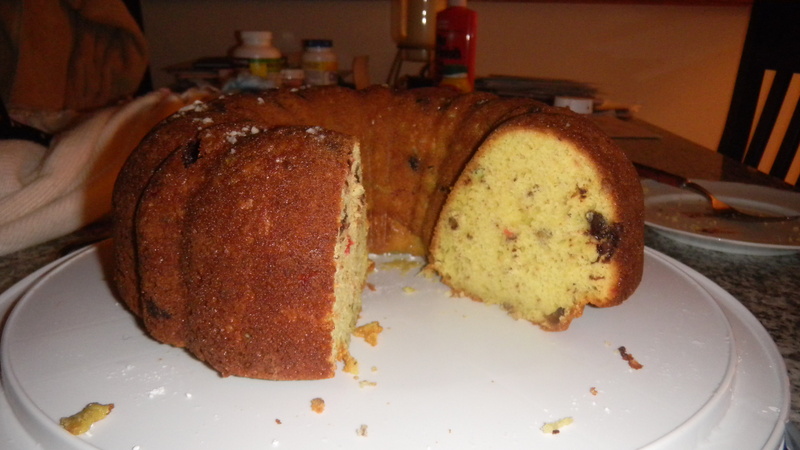 Bake the cake for about 1 hour and 15 minutes, until a toothpick inserted in the center comes out clean. 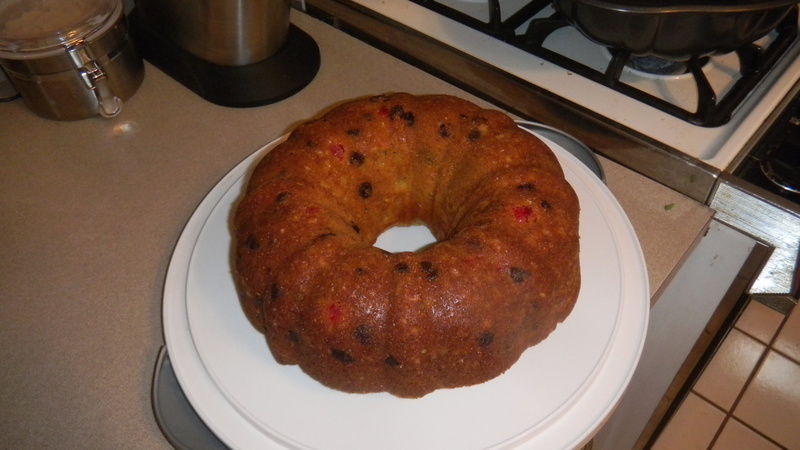 Let the cake cool in the pan for 15 minutes. Put the cake on a plate and serve. Yum. As the office is getting moved around as part of our office re-do, I’m becoming more discerning over what kind of wall decor we have. 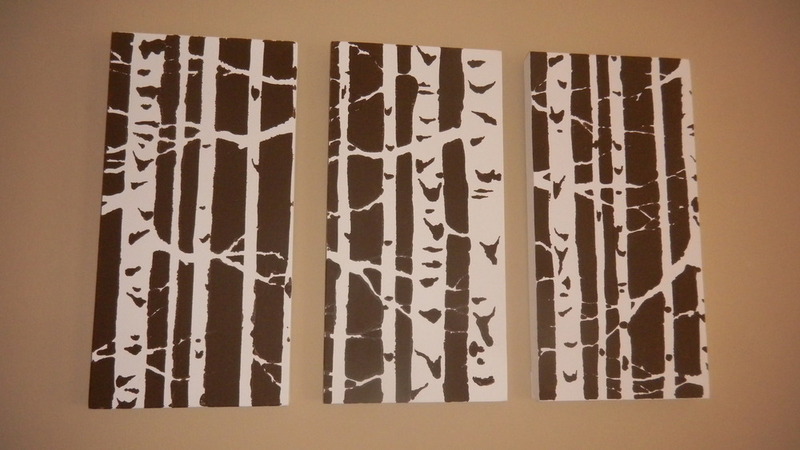 You saw how we made this birch tree wall art, and I’m very pleased with the result. It definitely adds something to the room. 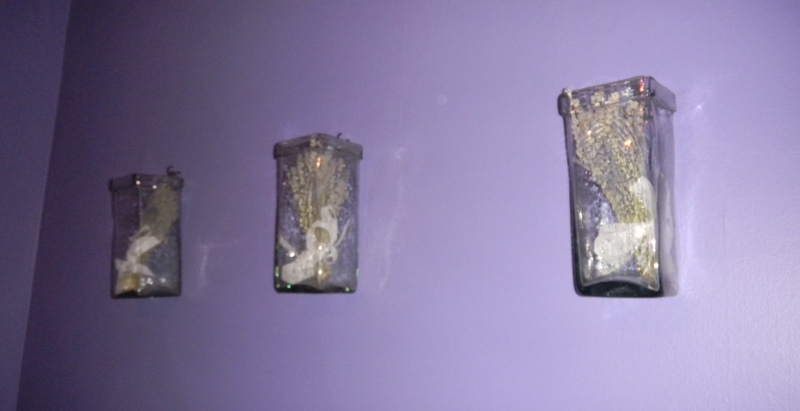 These square glass jars in our bedroom are hung from rustic looking hooks and are filled with lavender bunches. I think it adds to the serenity and peacefulness of the room, and the wonderful scent they produce is an added bonus. My main wall decor issue is with frames like this. While the photos of us are fine, and the collage was made with love years ago, it’s just not working for me anymore. The six part frame looks too commercial, too mass-produced, and without any character. 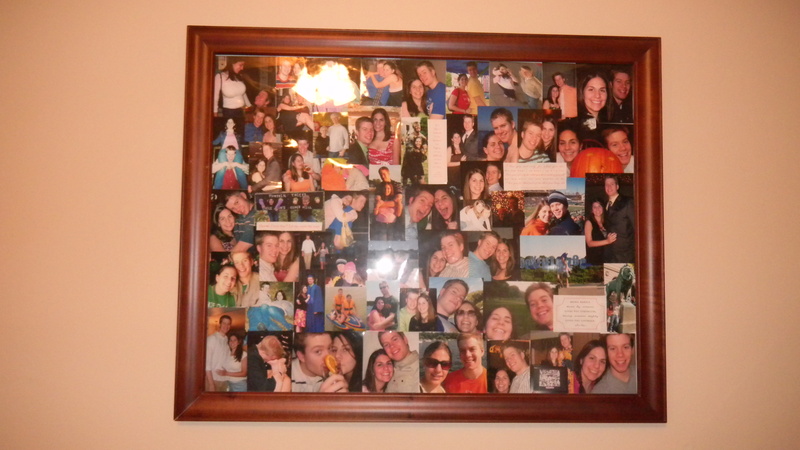 And the collage, well, it just doesn’t add anything to the space. But just as the office became the dumping ground for all objects without a home, it appears it also became the walls to put all old frames that had nowhere else to go. No more! 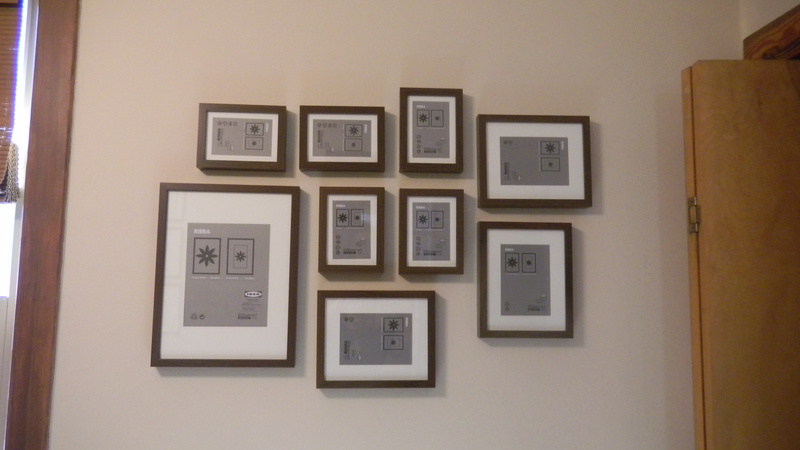 My first stab at creating a new wall decor scheme for the room came in the form of a frame gallery. Let’s get this project going. 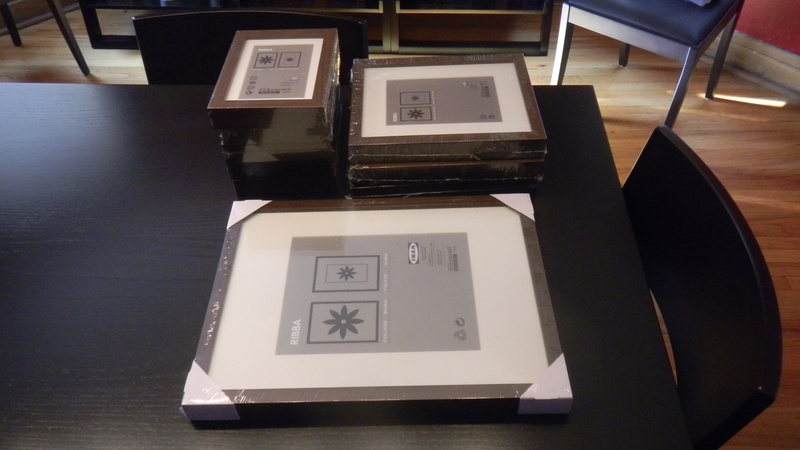 It started with a trip to Ikea and the purchase of RIBBA frames in different sizes. We chose the walnut finish, but they come in several others. We didn’t really go in with a plan, we just grabbed frames as we saw them and put them in the cart. When we got home, we took a look at our haul. Dan laid them all out on the floor and started arranging them until we came up with an arrangement we both liked. He picked up a nail and his hammer, and I could barely say “STOP!” fast enough. 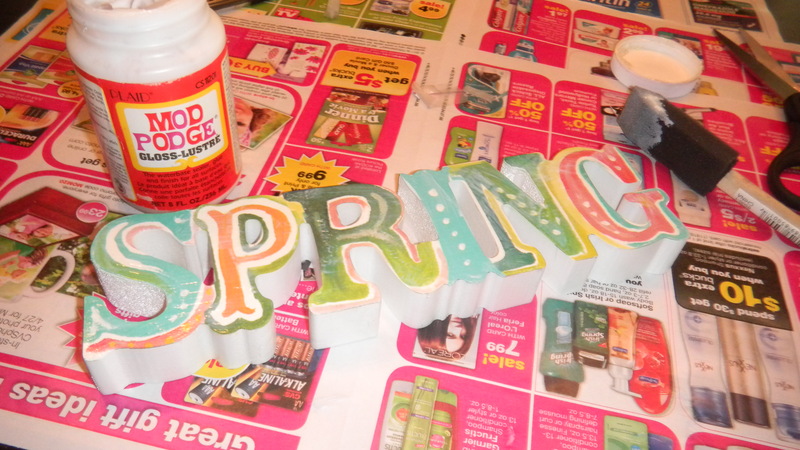 I wanted to make sure the spacing would look right on the wall before we started making nail holes. I took each frame and traced it on paper. 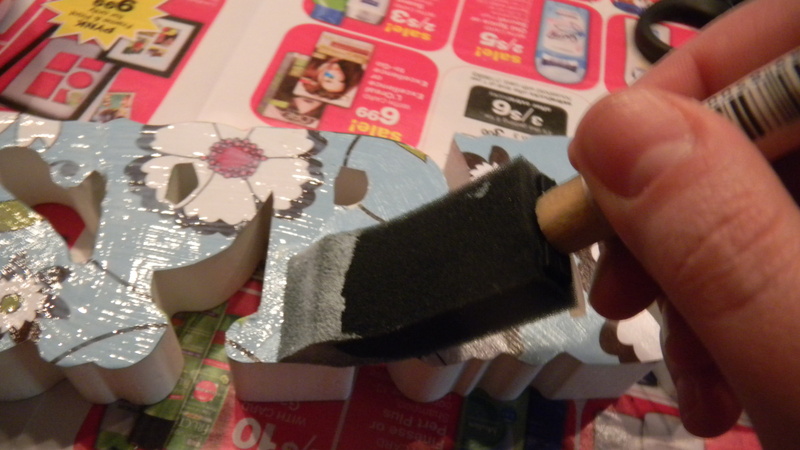 Next, I cut out each traced frame. 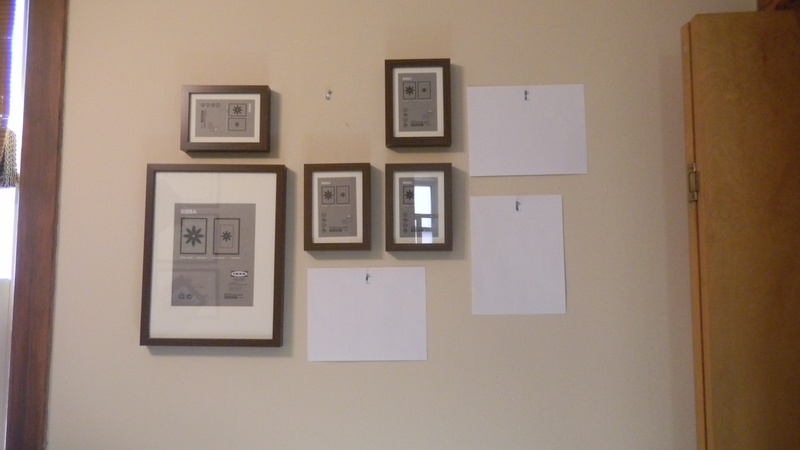 We taped them to the wall so we could see how the frames would look in relation to one another. 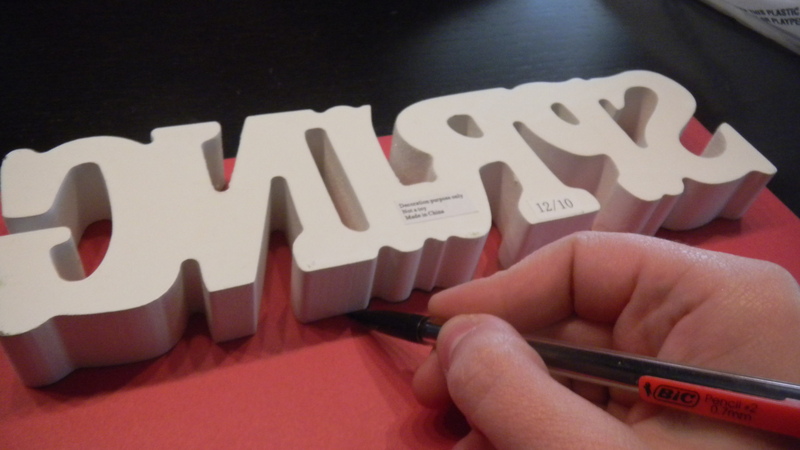 Dan measured and adjusted each piece of paper until we were satisfied. Don’t let the brief-ness of my explanation fool you. This part took quite a while, almost a whole morning, to get it right. For some weird reason, either our ceiling is on an angle, our floor is on an angle, or both because no matter how many times Dan measured, the frames didn’t look straight to me. After much adjustment, it finally looked right. 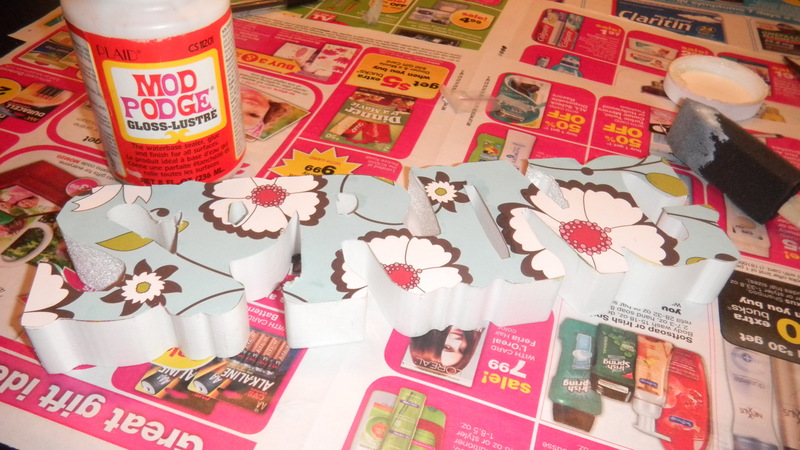 Now, the easier part! Dan strung the frame that needed it with frame wire, then adjusted the hanging brackets on the others to make them hang properly on the wall (this took some doing with a pair needle nose pliers and a bit of colorful language). Then he measured a few inches down from the top of each paper marker and marked the spot for the nail. Once the nail was in, he removed the piece of paper from the wall. Here’s how it looked half way done. Do that for every frame, and you get the finished product. I love the clean lines of the arrangement, and I really like the open space all around it. My preference would have been to do this in a long hallway, but until I have one of those, this will have to do. I did plan it out so that the frames can be seen from the hallway while walking by, if the door is open. Obviously, it’s not completely finished. 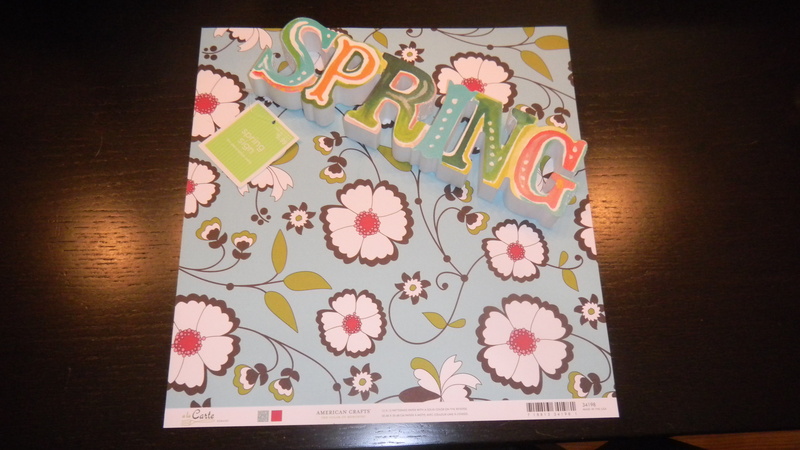 We’re working on gathering images, sayings, or even small paper items that mean something to us. Once the gallery is completed, I’ll be sure to share how it looks. Until then, I’ll be brainstorming what to do with my remaining naked office walls. I'm taking a slight detour from my normal posts about cakes and dinners and crafts to share what I'll be doing this Mother's Day with you. For the past 2 years, my Mom and I have done the Y-ME Network of Strength Walk for Breast Cancer. We have been joined by other friends and family as well. 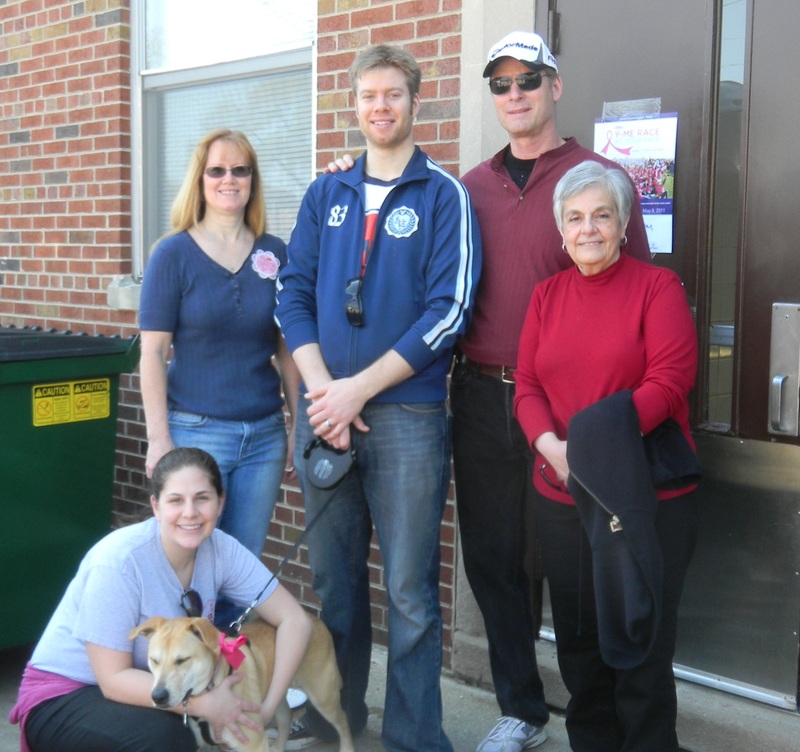 The photo is the group we had for our first walk, back in 2009. This wonderful organization is set up solely for those most affected by breast cancer – patients, survivors, families, and caregivers. Not every patient has a support system in place to help them through such a stressful and trying time of their lives. The Network of Strength provides the support these women need to fight breast cancer. This cause is especially close to my heart. 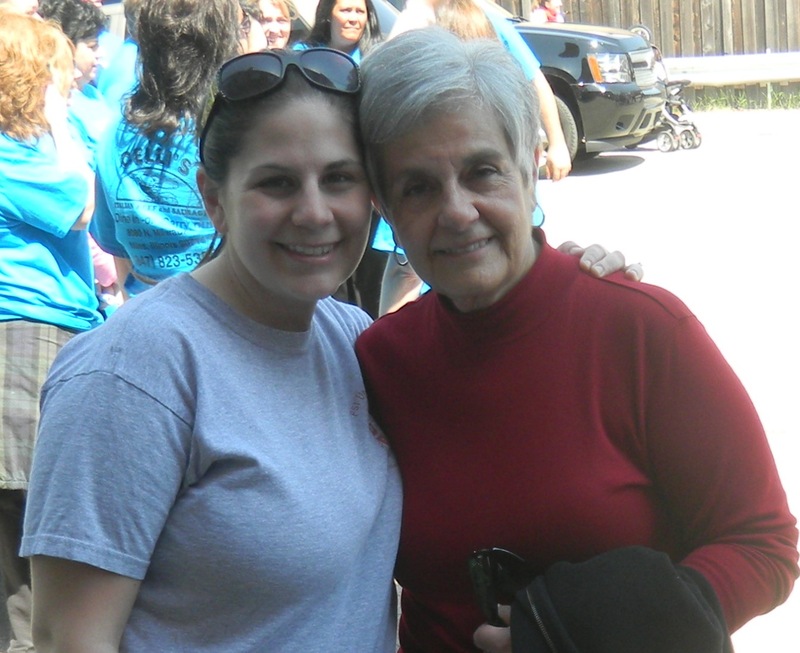 The reason my mom and I have made this walk a Mother's Day tradition is because she is a breast cancer survivor. We understand firsthand that overcoming this disease is truly a group effort. No woman should face breast cancer alone. I have set up a personal page on the Network of Strength website for more information and to accept donations. Thank you for your support. 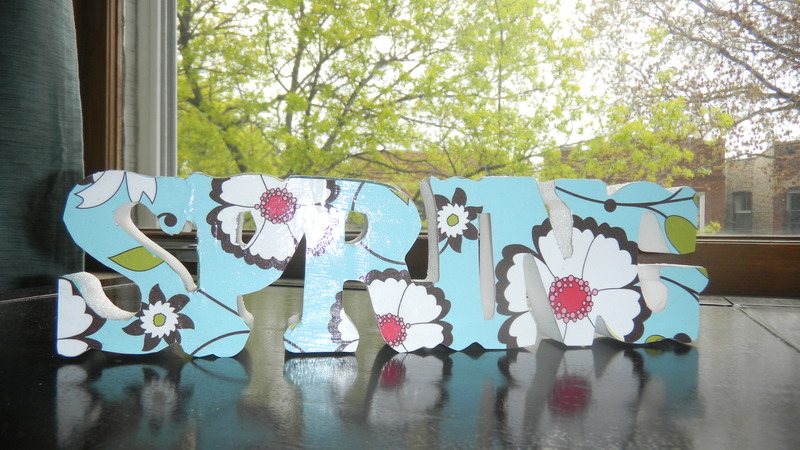 And to all the mothers out there – Happy Early Mother's Day! My dad celebrated a birthday this past weekend. Happy birthday, Dad! 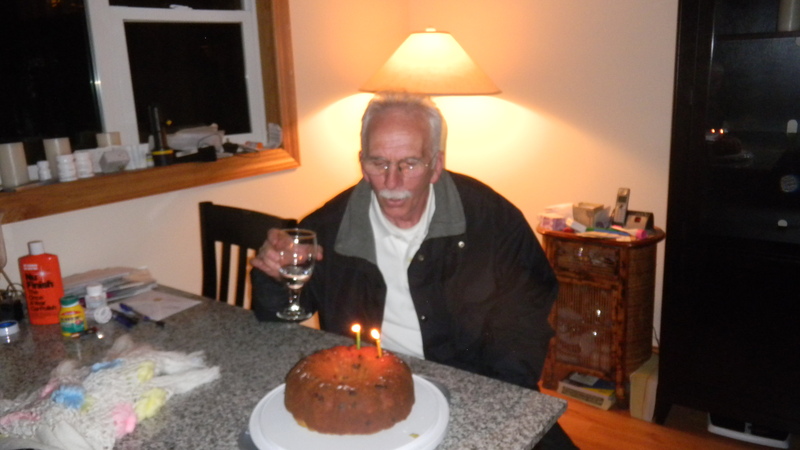 He blew out candles on a homemade Spumoni Cake I had baked for the occasion. 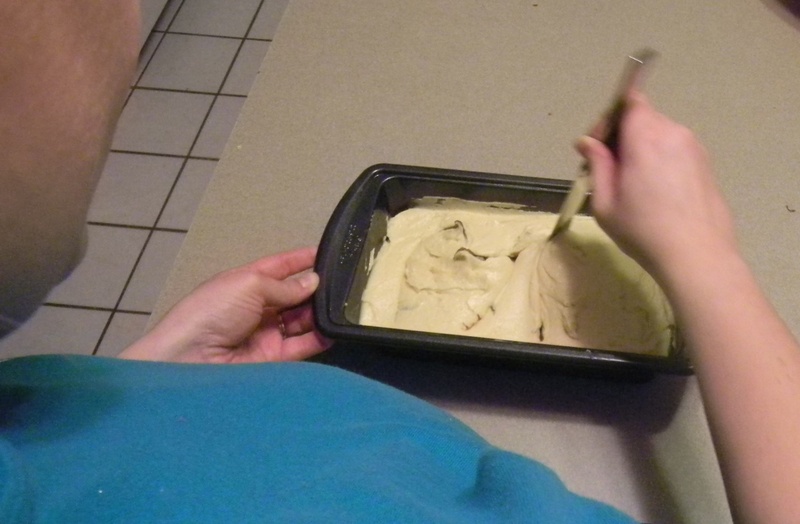 My dad’s favorite kind of ice cream is spumoni, so I thought I’d try to whip up a cake based on the ice cream. I was a little short on time due to a bunch of errands I needed to run and the fact that the car ended up in the shop hours before Dad’s birthday dinner, so I used a ready to make mix as my cake base. 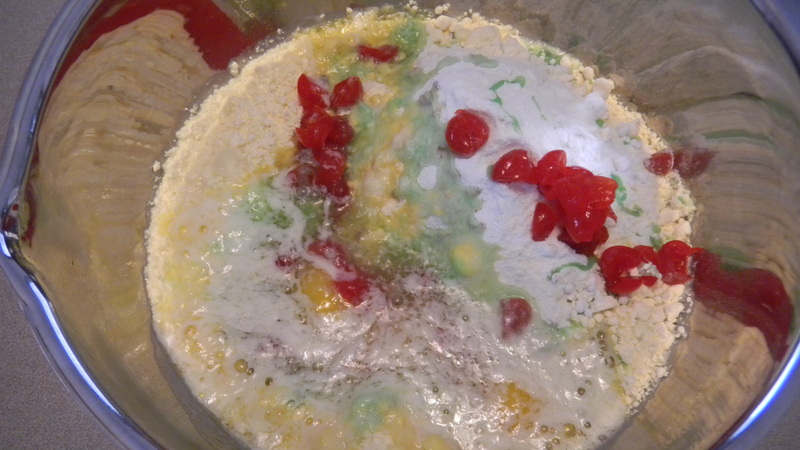 I started by putting the yellow cake mix, the box of pistachio pudding mix, the eggs, and the milk in a big mixing bowl. 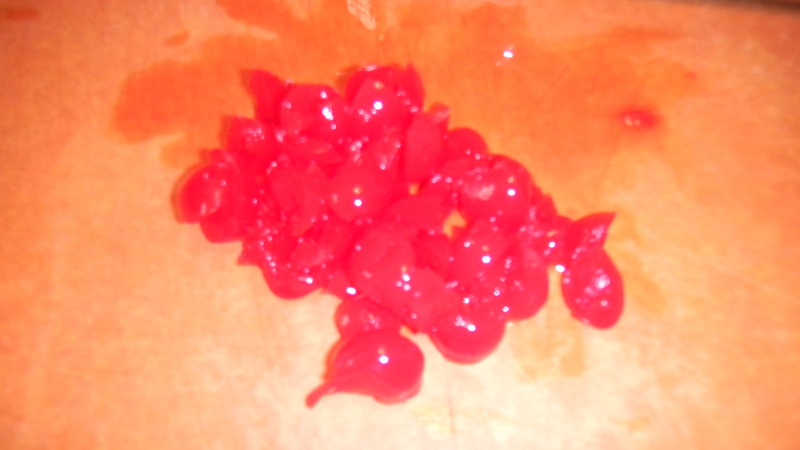 Next, I cut up the maraschino cherries and removed any stems I saw. I added the cherries to the bowl. Then, I mixed. The batter was a little lumpy, but I hesitated to use my hand held mixer on the batter because I wanted chunks of the cherries, not teeny, tiny pieces. Don’t worry, I called for some back up. Dan’s arm got a nice work out. 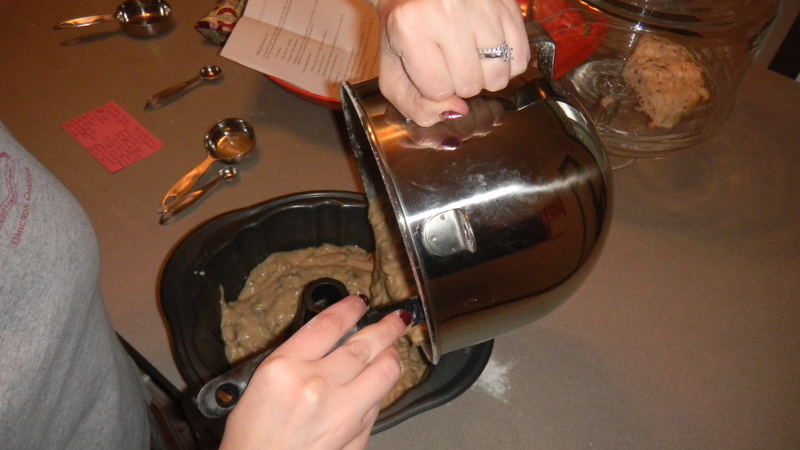 Once the batter looked thoroughly mixed, I added in the chocolate chips and the pecans. 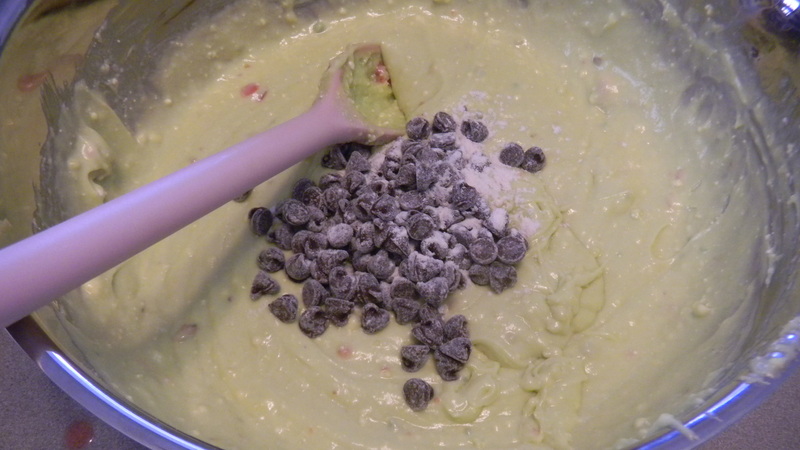 Stir it up again, just until the chocolate chips and nuts are mixed in, and the batter is ready. 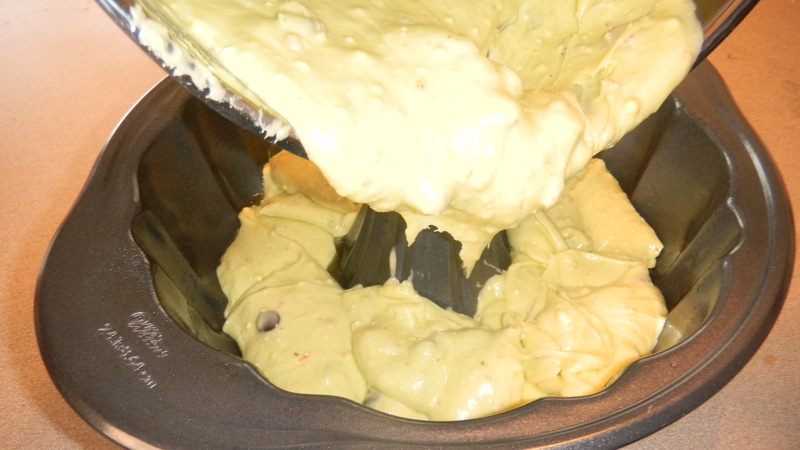 Pour the batter into a well-greased bundt pan. Get all the little crevices so the cake doesn’t stick. Bake the cake at 350 degrees for about 50 minutes, or until a toothpick comes out clean. 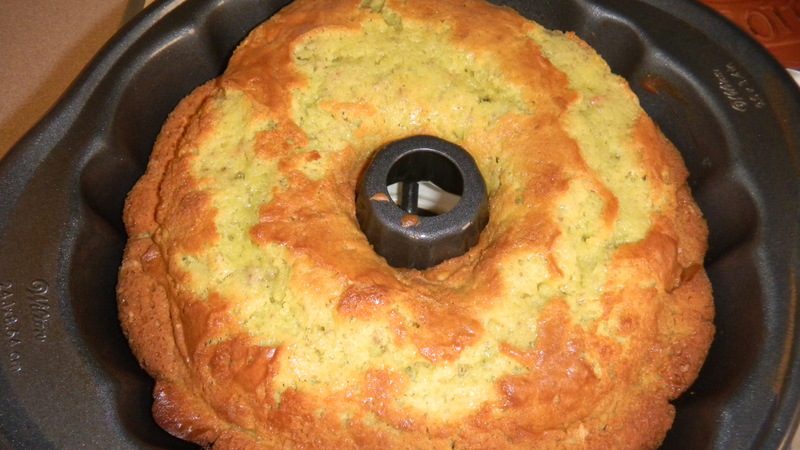 Once cooled, turn the pan over and the cake should fall right out onto your dish. I ended up sprinking a little bit of powdered sugar on top, for extra sweetness. If you wanted, a cherry frosting would probably taste really good with this cake, since the bits of cherry give an understated cherry taste to the cake. The verdict? He liked it! 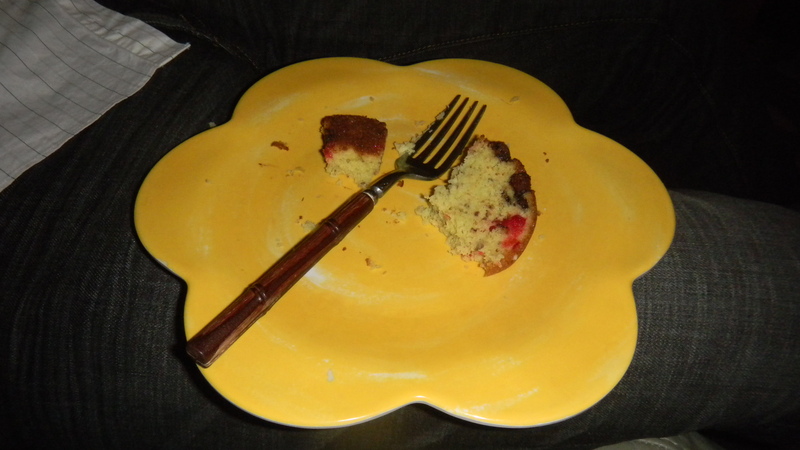 While it didn’t taste exactly like spumoni ice cream, it was a tasty cake.